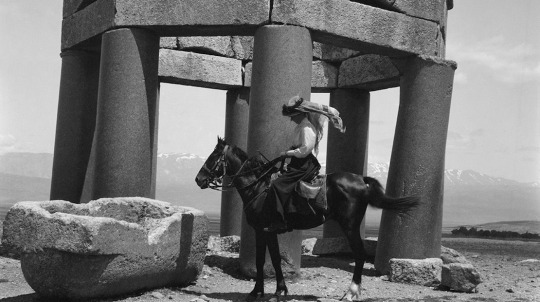 Portrait of Gertrude Bell who was a leading authority on the Middle East during the early part of the 20th century. She was one of the people involved in the redrawing of the lines of the various countries after the First World War and the founding of Iraq in particular. Uneven exploration of Bell's life told through her letters (read by Tilda Swinton) and the writings of her contemporaries (acted out as a series of talking heads) is very good at explaining who the person Bell was but not very good at explaining why anyone thought her opinion was of any importance. As portrayed here we see that she is a very intelligent young woman who loved the desert. We get the sense that she respected the people around here and thrived in learning about the cultures she encountered. But as told here there is never a jump, never an ah ha moment, where we suddenly know what got her the respect. To be certain once she is in the thick of things it kind of makes sense, but even so there is no sense of how we got there- shes at school, she meets some people (who we don't really know), she falls in love with a man (who is a cipher), she writes some books (which we really get no sense of), she's traveling and the Ottoman's are wary of her- but why? Forgive me. I've read on Bell. I have a friend who loves her and I know her story and the whys hows she rose to prominence. Some of it is here but some of it is not and the film is not as strong as it should be. Even on a personal level there are huge gaps in the telling with many people and events glossed over. Yes we get a sense of her inner life but not wholly the life she lived. I'm in a quandary- much of this works but so much is missing or missing context that the film just doesn't come together as a whole. I kept wondering why I should care despite knowing the answer. I suspect the over length of the film works against it since the film feels way too leisurely paced for what it is.